October 22, 2010 (KATAKAMI / BBC) — Finance ministers from the G20 leading economies are meeting in Gyeongju, South Korea, ahead of a summit by heads of state and government next month. Continuing tensions over exchange rates are likely to dominate proceedings. China is resisting pressure to allow the yuan to appreciate significantly, and many developing countries also fear a currency rise could hit exports. Low interest rates in wealthy countries have encouraged investors to seek better returns in emerging economies. 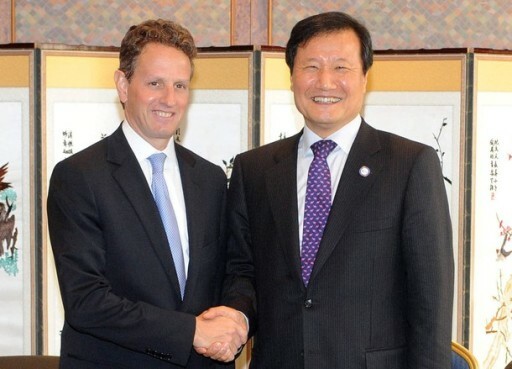 The G20 is trying to find a co-ordinated path out of the financial crisis. Perhaps their most immediate challenge now is to agree a common approach to the problems in the currency markets. All the signs are that the finance ministers will struggle to make significant headway. Many developing countries are concerned about upward pressure on their currencies, which could make their exports less competitive. Behind that pressure are very low interest rates in rich countries, which have led investors to seek better returns in emerging economies. That tends to push the currencies higher. 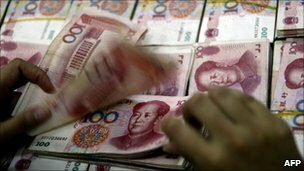 China has resisted this upward pressure on the yuan by buying dollars. That exacerbates the problem for other countries that compete with China. There is a widespread desire in the G20 to see China cut back on the intervention and allow the yuan to rise, expressed most forcefully by US officials. But China shows no inclination to make much of a move in the near future. The other factor behind the currency tension – the low interest rates in rich countries – is also unlikely to change soon. It is a result of their faltering economic recoveries. Indeed, there are signs that central banks in the US and UK might take further steps to simulate recovery, which could lead to still lower interest rates and even more money flooding into emerging economies, further aggravating the currency tension. SEOUL, Oct. 18 (KATAKAMI / Yonhap) — North Korea’s nuclear weapons program poses the most serious threat to the security of the Asia-Pacific region, South Korea’s top military officer said Monday. 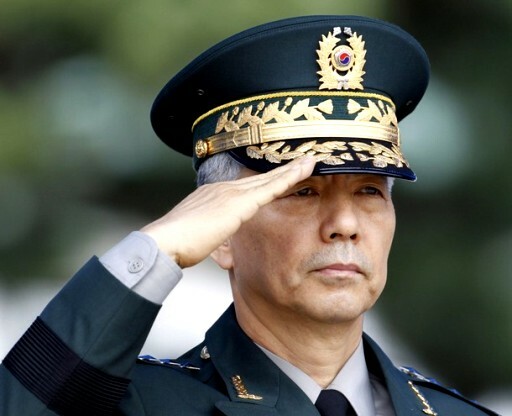 “North Korea’s nuclear program, as well as its weapons of mass destruction, is the biggest threat” to regional stability, Gen. Han Min-koo, chairman of the South’s Joint Chiefs of Staff (JCS), told reporters at an annual conference of military leaders in Seoul. It was not clear whether Han’s remarks were based on the recent reports of fresh activities close to the North’s main nuclear complex Yongbyon. Officials at the JCS declined to elaborate on the comments by Han, who also cited territorial disputes and pirates in Southeast Asia as security threats to the region. Recent satellite images by the U.S.-based Institute for Science and International Security showed construction activity near a cooling tower at Yongbyon, which the North blew up in 2008 as a show of its commitment to denuclearization. North Korea has signaled that it was ready to rejoin the long-suspended six-party talks on its denuclearization, but its motive remains unclear with images suggesting it might be preparing to restore the plutonium-producing facility. During the conference, Han said South Korea’s military would forge closer cooperation with its U.S. and Japanese counterparts to share intelligence on the North’s nuclear program. North Korea, believed to have enough weaponized plutonium for at least a half dozen bombs, declared it was quitting the six-party talks in April last year and conducted its second nuclear test a month later. South Korea is hosting the five-day Chiefs of Defense conference this week, with participants including U.S. Pacific Command Commander Robert Willard and Gen. Ryoichi Oriki, Japan’s chief of joint self-defense forces. The conference drew dozens of senior defense officials from 27 countries in the Asia-Pacific region. Coordinating ways to improve civilian-military cooperation at international peacekeeping missions and global collaboration on maritime security are among the topics on the agenda for the meeting that ends Friday, Seoul’s military officials said. US Assistant Secretary of State for East Asian and Pacific Affairs Kurt Campbell, right, speaks to the media after meeting with South Korean Deputy Foreign Minister Kim Jae-shin, left, in Seoul, 7 Oct. 2010. October 07, 2010 (KATAKAMI) — A top-ranking U.S. diplomat says Washington and Seoul need to “remain in lockstep” to respond to any developments on the Korean peninsula. Kurt Campbell’s meetings with South Korean officials come as Pyongyang shows signs that preparations for a power transfer are under way. Assistant Secretary of State Kurt Campbell repeated the U.S. position that Pyongyang needs to improve relations with Seoul before international talks about dismantling North Korea’s nuclear weapons programs can resume. North Korea has recently suggested several levels of talks with South Korea. Campbell spoke Thursday following talks with South Korean diplomats that he says focused on last week’s party congress in North Korea. The rare conference gave powerful posts to Kim Jong Un, the youngest son of absolute leader Kim Jong Il. The posts apparently are to prepare him to succeed his father. Official North Korean media Thursday reported the younger Kim attended a concert with his father. It is the second reported public appearance this week for the young man, who until recently was almost never seen. South Korea’s Unification Minister says the move toward a power succession in Pyongyang adds to uncertainties about what is happening in North Korea. Recent satellite photos suggest North Korea may be preparing to restore some operations at its Yongbyon nuclear complex. The reactor, which produced weapons-grade plutonium, was shuttered three years ago under an international agreement. North Korea has since renounced the deal and threatened to resume operations. Last year, the reclusive impoverished country said its uranium enrichment experiments were in the final stages. Enriched uranium is used for weapons. There have been on and off negotiations, involving both Koreas, China, the United States, Japan and Russia, since 2003 concerning the North’s nuclear weapons programs. The two Koreas remain technically at war since their civil war halted in 1953 without a peace treaty. Relations between the two governments have been tense for more than a year. They worsened further in late March when a South Korean naval vessel exploded and sank. An international investigation blamed a North Korean torpedo. Pyongyang denies any responsibility and rejects Seoul’s repeated demand it apologize for the sinking as a prelude to improving ties. (KATAKAMI / BBC) — The man nominated to be South Korea’s new prime minister has withdrawn his candidacy amid allegations about past financial irregularities. Kim Tae-ho faced questions from lawmakers at his confirmation hearing last week about suspected misconduct when he was a provincial governor. At 47, Mr Kim was the youngest person to be nominated for the largely ceremonial post. He was put forward by South Korea’s president earlier this month. Mr Kim is accused of under-reporting his income while he was governor of Gyeongsang province, that he illegally took bank loans to fund political campaigns. Mr Kim was also criticised by lawmakers for making local government employees do his household chores. His wife was also criticised for using provincial government employees and vehicles for her own private use. “I am giving up the designation in order not to do more damage to the president’s political operations,” Mr Kim said. “Even if I become prime minister, how could I do anything if I do not have the people’s trust?” He said. President Lee Myung-bak nominated Mr Kim in an attempt to connect with a younger generation of South Koreans. Mr Kim was being groomed as a possible replacement to lead the ruling Grand National Party after President Myung-bak’s five year term ends in just over two years time, correspondents said. SOUTH KOREA, who previously had won just a single World Cup finals game away from home, this time romped through in a canter. Their two goals could have been doubled or even trebled and it was highly appropriate that the second of them, early in the second half, should go to the Manchester United attacker, Park Ji-Sung. Nominally playing on the far left, he popped up wherever he pleased, always quick, intelligent and splendidly elusive. His goal, however, had all too much to do with the ineptitude of the Greek centre-back Loukas Vintra who clumsily failed to clear an easy enough ball, enabling Park to dance through and easily beat the Greek keeper Alexandros Tzorvas low into the right-hand corner. The Greece coach, Otto Rehhagel, said on qualifying: “This time, we’ve climbed the mountain and we can be proud.” But after this result they may be said to have plunged down a crevasse. It was in 2004 that Greece so surprisingly won the European Championships in Portugal. The big striker, Angelos Charisteas, who scored in the 2004 final, played yesterday, one of four survivors. But the three-man attack had little impact on the South Korean defence. Indeed, we had to wait until the 80th minute before another of the Greek strikers, Theofanis Gekas, brought the South Korean goalkeeper Jung Sung-Ryong into action with a hooked left-footed shot that Jung turned over the top. Gekas was the most prolific scorer in the European qualifiers with 10 goals. You could hardly blame him yesterday for the general ineptitude of his team’s attack; he did what he could, but there was pitifully little coming to him from the flanks or from behind. The Greek tactics were hard to understand, though their 4-3-3 formation had worked well in the past and was good enough to beat Ukraine in a playoff to reach South Africa. Their decisive goal that night was scored by Dimitrios Salpingidis, though yesterday he started on the bench and came on for the generally ineffective Celtic striker Georgios Samaras after 58 minutes. Given the expensive and embarrassingly error by Vintra it was hard not to wonder what the Liverpool centre-back Sotirios Kyrgiakos might have done much more effectively in his place. The whole South Korean team were far more flexible, quick and enterprising than their opponents. Especially effective was the dynamic overlapping of Cha Du-Ri, the right-back. He is the son of the first major star his country produced, the winger Cha Bum-Kun, who flourished years ago in the German Bundesliga. On 63 minutes, an especially effective piece of attacking by Cha was crowned with a cross that gave Park Chu-Yung an excellent opportunity but he headed the ball wide. The first South Korean goal came after just seven minutes. A free kick from the left brushed the hapless head of Greece’s Kostas Katsouranis, enabling the South Korean centre-back Lee Jung-Soo to drive the ball home. Seven minutes later Lee Chung-Yong felt, with perhaps some justification, that he had been fouled in the box, but no penalty was given by the New Zealand referee Michael Hester. South Korea kept up the pressure and on 25 minutes looked unlucky not at least to have been given the opportunity to score. Park Ji-Sung cut in, this time from the right, and appeared to have an excellent opportunity to shoot, only for the referee mysteriously to give a free kick against him. The supposedly solid Greek defence was frequently found wanting. When Park Ji-Sung sent Park Chu-Young through, a very late desperate lunge by Vintra gave a slight deflection to the ball, enabling Tzorvas to save athletically. Just before half-time sudden and unexpected confusion on the part of the Korean goalkeeper Jung gave Gekas a chance, but he couldn’t make full contact. Rehhagel tried to ring the changes in the second half and there was fractional improvement in what had been a plodding performance, but overall, the South Koreans were vigorously dominant. South Korea got their World Cup off to a winning start against Greece yesterday to emphasise their position as Asia’s most successful country in the competition. Ranked 47th in the world — 35 places below the Greeks — they finished in fourth place when they shared the finals with Japan in 2002. It was that performance which alerted the top European leagues to their players, Manchester United’s Park Ji-Sung being their most famous export. The Koreans first qualified for the finals in 1954 and have competed at every tournament since 1986. They will want to avoid a repeat of the 2006 finals in Germany when they also won their opening game, against Togo, but were eliminated after taking a single point from their final two games.